If you’ve dashed out for an upgrade and ended up with the Samsung Galaxy S6 you’ve made a great choice! However, you’re probably wondering where to buy a case that compliments the phone’s devilish good looks. Finding the best Samsung S6 case or cover isn’t easy, so we’ve rounded up a bunch to suit even the most style conscious, or indeed those in need of a military drop tested number – whatever the scenario, we’ve got you covered! Feel like your phone is too good looking to cover up? If so this one could be perfect for you. The case is ultra thin, lightweight and built with impact protection using a ‘flex shock’ scientifically proven method. It also comes in a variety of colours giving you the flexibility to choose the one which best compliments your handset. Incipio’s classic white NPG case compromises of a soft-shell case, making it easy peasy to apply and take off, yet providing good solid protection from bumps and knocks. The material is stretch and tear resistant so it’s unlikely break anytime soon. The case’s exterior is smooth to grip and it’s slimline design truly makes it look like its part of the phone. – A fantastic buy at a great price. This one piece of flexible rubber combined with durable polycarbonate means your getting something which will slide off and on your phone with ease, yet remaining sturdy. The pull out stand on the back makes the case ideal for watching movies and TV shows in glorious widescreen view. Available in matt black and white, this case looks sharp in either. The UAG military drop tested case is one manly, hulk of a case to accompany your device. Despite being light and extremely easy to put on and take off your phone, this case means nothing will damage your phone anytime soon. The UAG provides plenty of room for you to plug in devices into the phones ports, so there’s no taking of the case each time you want to listen to some music. If you know you’re clumsy or live an extremely active life, this case is perfect for you. 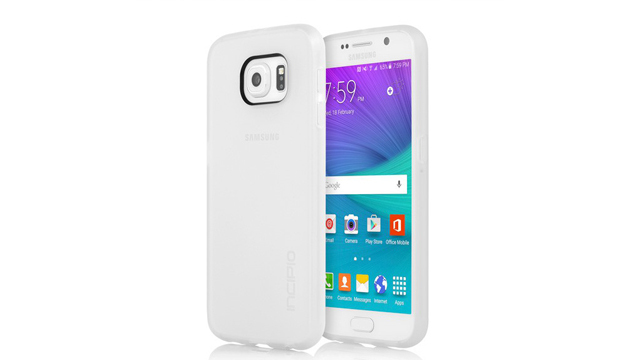 Possibly the best-looking Samsung Galaxy S6 case we’ve come across. Featuring a design, which is tough enough to protect your phone from, bumps and knocks and yet without adding unnecessary bulk, this case is one strong contender. Its matte surface is perfect for grip and oozes quality, with it’s slim-line fit. For the style conscious amongst us, the Ted Baker Hexwhizz wins on quality and finish, crafted from black faux-leather. This flip case possesses a magnetic closure system ensuring that your device is surrounded in luxury in your pocket. The cut out section on the back ensures that there’s no need to fiddle around taking the case off each time you want to snap away. The only downside of this case being that it is more expensive than our other picks. Ever feel like your weighed down with an unnecessary amount of possessions in your pocket each time you want to go out? With the Verus Damda Slide you can store your credit cards and ID in the back of your case with a secret slide compartment. It’s tough hard-shell design makes sure your phone is well protected, yet its relatively slim-line design provides optimum comfort and snug grip. Not the most attractive of cases but its secret compartment is a fantastic feature. Fancy a more unique case? The Woodback Snap cases are laser cut and hand-sanded in a variety of finishes such as: walnut, bamboo and ash. Offering all round protection and made from real wood, each case has a unique grain pattern making and individual case. The sustainably sourced wood also acts as solid, hard, protection for your device, whilst containing cut outs so you don’t lose out on the phone’s functionality.